Which issues relating to the places you live, work or visit in Stroud District are of particular concern to you? * Which issues relating to the places you live, work or visit in Stroud District are of particular concern to you? * Are these matters likely to grow in importance over the next 20 years? * What are the planning options for starting to address them? There will be ten public exhibitions around the District during October and early November 2017. Details of locations and times are in the first attachment. 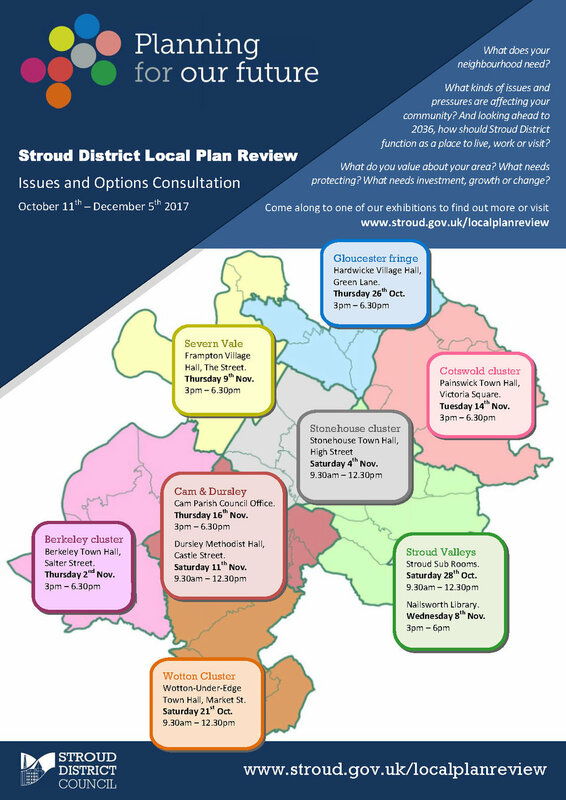 At these you will be able to chat to officers working on the Local Plan review and find out more about the issues affecting Stroud District. SDC officers will also be emailing agents, developers, key stakeholders, local interest groups and members of the public who have expressed an interest in the Local Plan to involve them. SDC also want people who live, work or visit the District to engage with them. Indeed the earlier in the plan production process the better. You can help shape the future Local Plan vision, its strategy, its priorities and its planning policies. Get involved. Further details on the consultation and background documents can also be accessed through SDC web pages at www.stroud.gov.uk/localplanreview from 11th October to 5thDecember 2017.